Mold growth in your home or business is a serious problem, and if you suspect mold growth you should be concerned, as mold growth is often a result of another problem that has yet to be discovered. Mold problems typically originate from moisture sources like improperly restored water damage, broken pipes, malfunctioning appliances or ongoing and unnoticed leaks from pipes, roofs, doors and windows. This moisture allows the mold spores to multiply and spread to other areas of your property. The first step in the mold removal process is to locate and address the source of the moisture. If the moisture is not dealt with first, the mold growth will return. 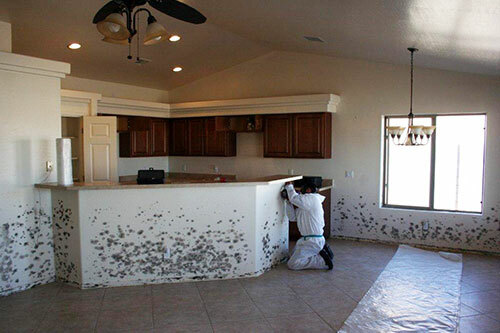 Valleywide Restoration’s certified technicians will locate the moisture source and recommend the proper steps to remediate the situation as fast as possible. Next, our technicians will get to work cleaning up and removing the mold. Our mold remediation procedures follow industry protocols, including EPA and OSHA guidelines and the IICRC S520 Standard. Extra care is taken to ensure the mold spores are contained and airborne mold spores are removed. After cleanup is complete, you can rest assured that the mold growth has been removed and your home or business is safe and clear of mold. Many people worry about the health effects of mold exposure, and breathing in mold spores has been shown to cause respiratory problems or an allergic reaction. Removal of mold from your home often solves hidden health issues by removing the source of infection. Mold growth is fairly common in basements and crawlspace areas, as these areas tend to be cooler, lack adequate ventilation, and have a higher risk of water damage. Many times, people associate basements and crawlspaces with a damp, musty odor that can also be indicative of a mold problem. Mold growth can occur in various areas and on many surfaces including walls, floors, ceilings, and around windows. Hidden mold growth may be found on walls behind furniture or appliances, beneath flooring or carpeting, and even on insulation inside walls. If you have visible mold growth or suspect mold is growing in your basement or crawlspace, call Valleywide Restoration today. Despite it’s name, drywall will wick and absorb water during a water loss and requires fast, proper drying to effectively prevent mold growth. Mold requires food and water to grow and multiply, so when drywall gets wet, the mold can feed on the paper covering the front and back of the drywall, making it an ideal host. When faced with water damage, many people who try to cleanup the water themselves focus on cleaning up standing water, extracting water from carpets or flooring, and drying floors. During the time it took to cleanup the mess, the water was being wicked up into the walls completely unseen. Fast-forward a few days, and you might start to notice a musty smell, or notice visible mold growth on your walls. The best way to prevent mold growth after a water damage is to have your property professionally dried by an experienced company. At Valleywide Restoration, we will test moisture levels in walls and floors and ensure that is thoroughly dried, and will check for other areas of hidden water damage. 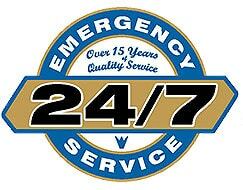 We’ll work fast to safely dry your property while reducing the risk of mold growth. If you think you might have mold or mildew affecting your property, give us a call and we can test for it. Mold can be a significant health risk. Having it checked out by a mold inspector is easy and can give you peace of mind.